The Rediscovery Centre has been at the forefront of the Irish Circular Economy since 2004. In 2013, the Rediscovery Centre embarked on an ambitious plan to build the National Centre for the Circular Economy which would demonstrate best practice and bring together all of the skills and resources required to embrace sustainability and stimulate climate action. Open to the public from May 2017, the Rediscovery Centre has gone from strength to strength. This success has been driven in large part by huge public interest and a daily influx of visitors from schools, businesses and universities from across Ireland and internationally, who have come to the centre as conference delegates, as attendees of courses run by our social enterprises, and as customers in our café and ecostore. Equally important has been the strength of the partnerships we have formed with key policy makers, local government and mission-related organisations. 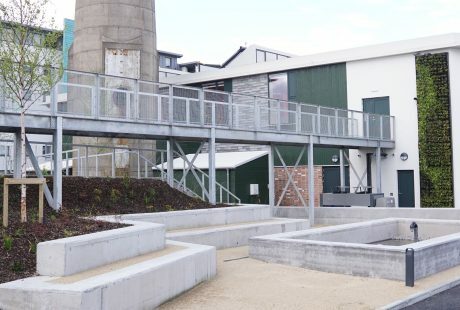 The centre was built with the support of the European Commission’s LIFE+ programme, Dublin City Council, the Department of Communications, Climate Action and the Environment, and the Department of Housing, Planning and Local Government. As the Centre prepares to lead the change for the circular economy on a national scale, the great work at a local level continues to be supported by Dublin City Council and the Department of Housing through the Social Regeneration Fund which last year funded more than 70 people in workplace training and internships. In late 2018, following almost two years of development, we entered a three-year strategic partnership with the Environmental Protection Agency to further develop the Rediscovery Centre’s activities beyond EU support. This partnership will ensure that circular economy practice is supported on a national scale. In addition to this, we have been approved for funding under Pobal’s Community Services Programme (CSP). This support will create five new jobs within the centre, including the appointment of a Centre Director who will drive the development of the centre as a national exemplar of circular practice and a world-class visitor attraction. Details of all current vacancies – including workplace training and internships – can be found here.